Diamond is April’s birthstone. Diamonds comes in many different colors. love and friendship reign forever, never to be separated. If you were born in March, you’re lucky enough to have aquamarine as your birthstone. Aquamarine is a member of the beryl family, which also includes emerald. Aquamarine exists in many different shades, from pale blue to greenish-blue shades. Deeper colored aquamarine stones have the highest value, and connoisseurs typically prefer a pure blue stone with no green or gray in it. However, aquamarine is stunning regardless of the shade. Aquamarine is unique in that it never has inclusions, meaning that it’s flawless. In very rare cases, the stone will have inclusions that are only visible through magnification. Aquamarine stones are available in various shapes similar to diamonds but is often found in oval or emerald shapes. Aquamarines vary in color from pale blue to greenish-blue. 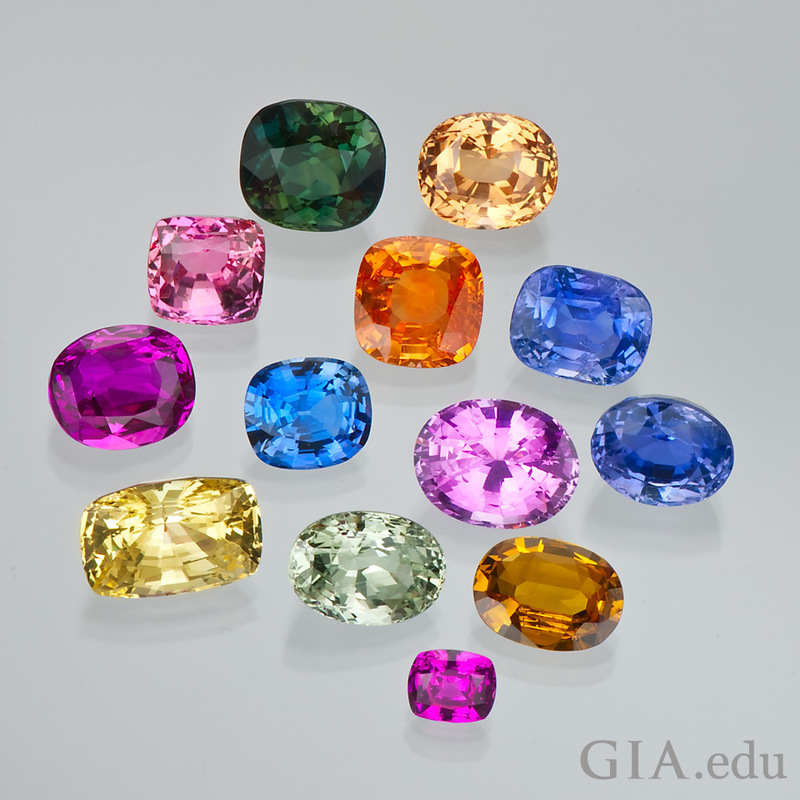 The varying intensity of the color is due to the quantities of iron in the beryl crystal. Naturally occurring deep blue aquamarine stones are rare, expensive, and in high demand. 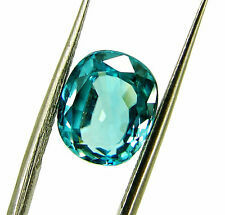 Aquamarine with a greenish color is often heated to remove the yellow component of the color. You can still find aquamarine that’s greenish in color, and these stones will be less expensive than aquamarine that has more blue to it. The icy blue color of aquamarine is flattering to a variety of skin tones, making this stone a timeless classic in the gem world. Aquamarine is mined in Nigeria, Zambia, Pakistan, Brazil, Mozambique, and Madagascar. The largest source of aquamarine is Brazil. Aquamarine has a hardness of 7.5 to 8 on the Mohs scale, meaning that it is a durable gemstone that’s perfect for everyday wear. Heat exposure is not recommended for aquamarine, but the color will remain the same even when exposed to light. To clean your aquamarine jewelry, use mild dish soap and a toothbrush to clean behind the stone where dust can collect. Cleaning aquamarine using ultrasonic and steam cleaners is usually safe unless the stone has liquid includes or fractures. 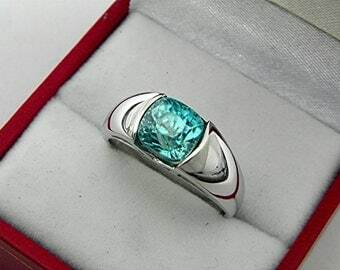 This is rare, but if your aquamarine stone has fractures, you should only clean the stone using warm, soapy water. 1. Red rose is a symbol of love and beauty ….On Valentine’s Day, most of us give and receive red roses. Recently I’ve read that more than 189 million roses are sold in the United States so I can’t even imagine how many roses are sold in the whole world. A red rose is the favorite flower of the Roman goddess of love – Venus. We often give red roses to show our love, devotion and appreciation. 2. The Declaration of King Henry…..Nowadays Valentine’s Day is an official holiday in many countries around the globe, and it’s all thanks to King Henry VII of England. He declared February 14th as the national holiday of Saint Valentine’s Day. We shouldn’t forget about him and his declaration. Don’t take this holiday for granted. It’s important to know its history and appreciate people who helped us enjoy a day of love without feeling guilty about spending money and eating chocolates. 3. Chocolate helps boost mood…..Are you absolutely lonely on Valentine’s Day? Stock on chocolate to boost your mood. You can treat yourself to a box of your favorite chocolates without feeling guilty. In the 1800s many doctors recommended eating chocolate to improve mood and get over a breakup faster. While most women can’t allow themselves to eat chocolate each day, Valentine’s Day is the perfect time to enjoy it without worrying about your diet. 4. 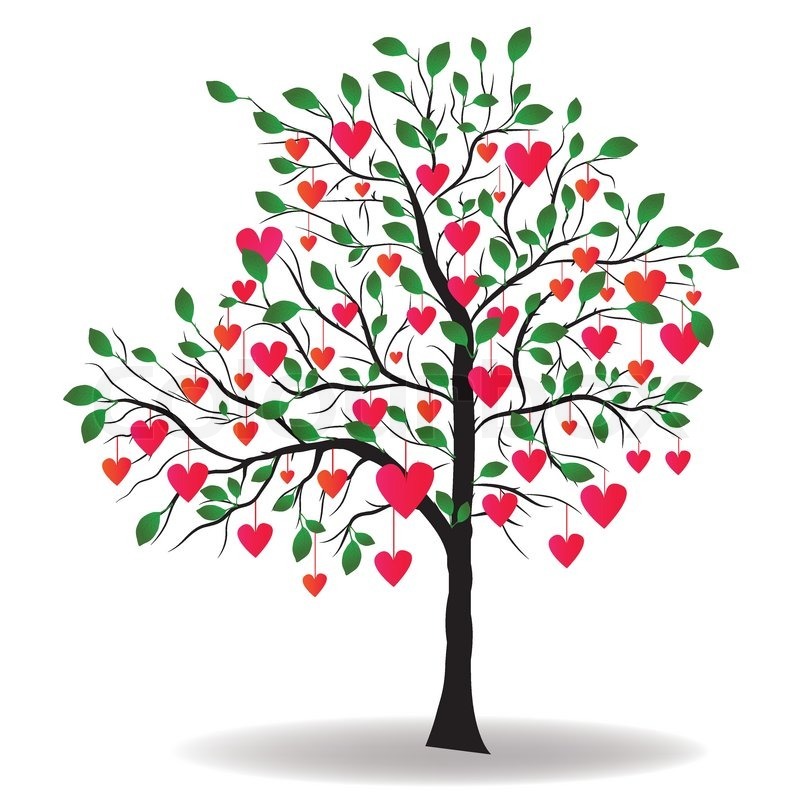 Brave Valentine…..There are many stories about the origin of Valentine’s Day, but the most popular one is about brave Bishop Valentine who went against Claudius II -270 A.D. and married lots of couples in secret. The thing is, during the wartime, Claudius didn’t allow men to marry because he believed single men are stronger and braver than married men. But Bishop Valentine didn’t accept this prohibition. He helped many couples to get married, but unfortunately, was jailed for it, and executed on February 14. Before his execution, he wrote a love letter to the daughter of the jailer and signed it ‘From You Valentine.’ We don’t know whether it’s true or just a myth, but it’s so romantic, don’t you think? 5. Men buy more flowers and gifts than women….Whether it’s good or bad, but men tend to spend more money on flowers and gifts on Valentine’s Day than women. Men buy 73 per cent of flowers on February 14 and it’s a good news. I know many guys who think that flowers are just a waste of money. Hopefully, your partner doesn’t think so. 6. Who’s Cupid?…..It’s probably a rhetorical question. Though, according to ancient Greek mythology, Cupid was the god of love, the young son of Aphrodite, and he was known to the Greeks as Eros. According to Roman mythology, Cupid was the son of Venus. I don’t know whose son Cupid was, but I see Cupid as a lovable baby that holds a bow and arrows and helps us find our love. 7. The Medieval times….Did you know about how people celebrated Valentine’s Day during the Medieval times? Young people drew names from a bowl to find out who would be their Valentine. They wore this name on their sleeve so that others saw it. Moreover, women were ready to eat some strange foods on February 14 to look more beautiful. I don’t think that eating bizarre food could help us look better, so let’s eat more fruits and vegetables instead. 8. The first box of Valentine’s Day chocolates…..It’s hard to imagine Valentine’s Day without chocolates. We buy those boxes of Valentine’s Day chocolates without knowing that the first box was introduced by Richard Cadbury in far 1868. Richard Cadbury’s heart-shaped candy box is another symbol of Valentine’s Day. Amethyst’s purple color can range from a light lilac to a deep, intense royal purple, and from brownish to vivid. 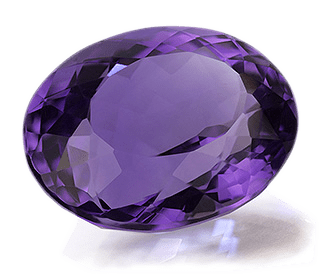 Amethyst also commonly shows what is called color zoning, which in the case of amethyst usually consists of angular zones of darker to lighter color. Most people do not realize garnets come in a wide variety of gem types and colors, with many cutting options. 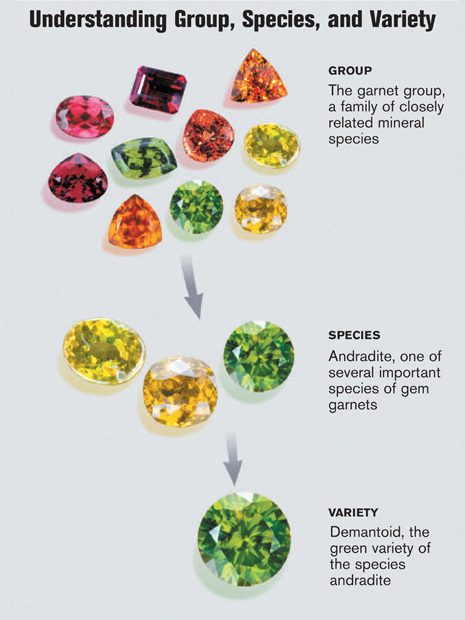 Garnets are a group of closely related mineral species with many different color varieties. 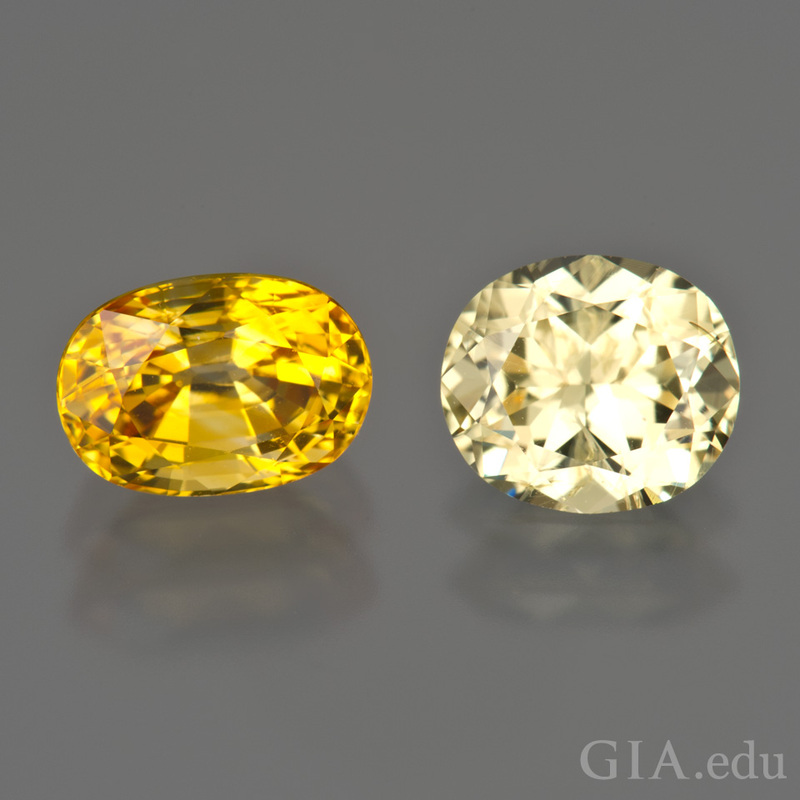 The prices and values of fine zircon vary depending on the size and quality of the gemstone. 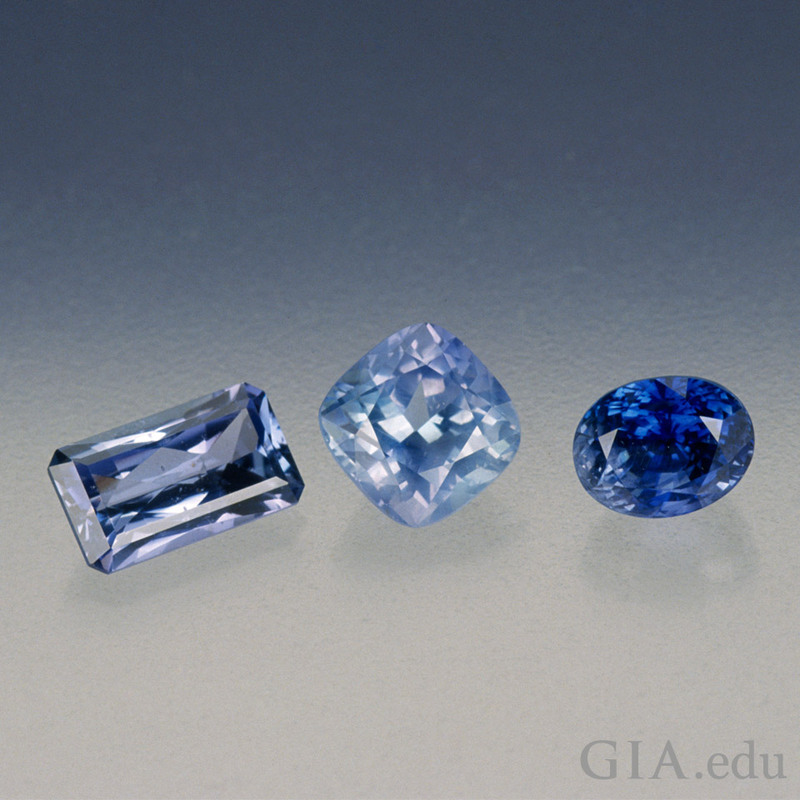 Blue is the most popular zircon color, followed by honey, red and white. 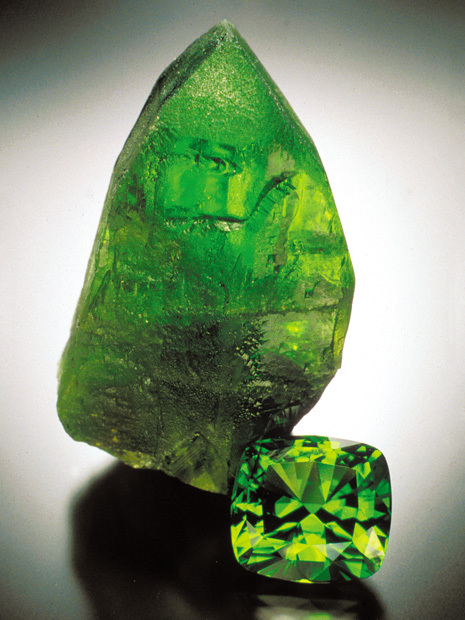 Green zircon, resulting from the effects of natural radioactivity, is rare. In blue zircon, look for a saturated blue. Clean gems in large sizes are especially valuable. 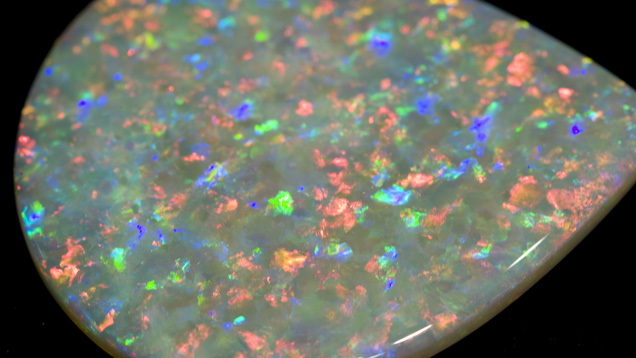 While the colorful glory of the opal is undeniably striking. Opals range in color from white to black, with glints of yellow, orange, green, red and blue. They derive their name from the Greek word Opallos, which means “to see a change (of color).” Opals were formed by non-crystalline silica gel that seeped into crevices within sedimentary strata. Over time the gel hardened to form opals. They’re essentially composed of particles closely packed together in delicate arrangements. 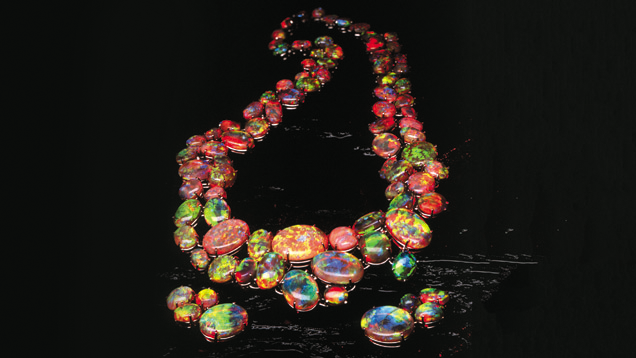 When these particles are packed together in a regular pattern, they create a three-dimensional array of spaces – which create the opal’s unique radiance. 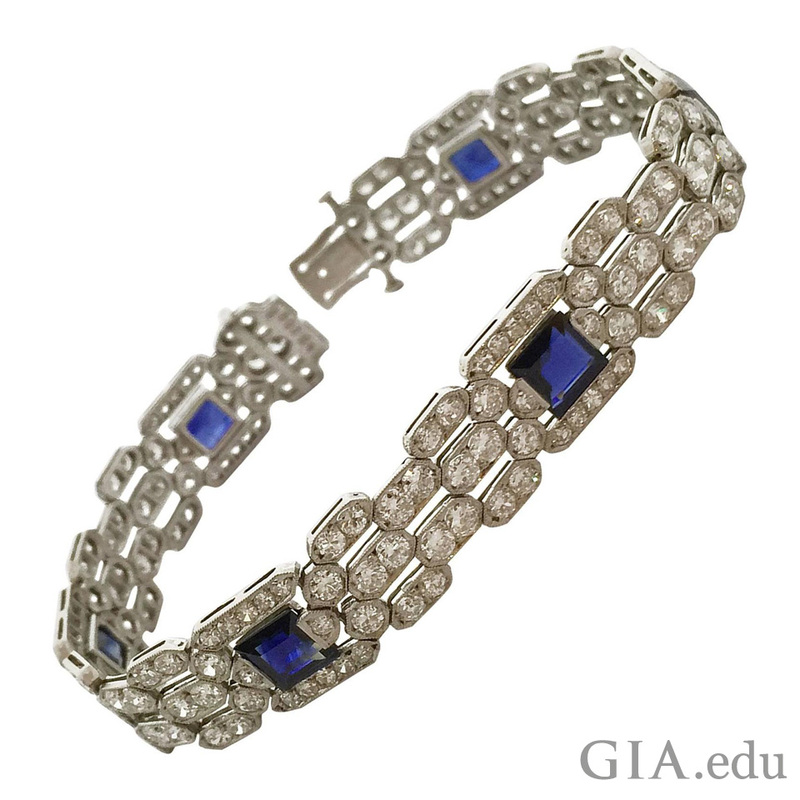 Sapphire is a popular gemstone – and comes in a rainbow of colors. It’s also been long prized, from Ancient Greek rulers to the clergy of the Middle Ages. But where does the September birthstone come from? Before we embark on our journey to find the September birthstone, let’s start with a little gemological background. The September birthstone, sapphire, comes in a range of colors: blue, violet, green, yellow, orange, pink, purple and intermediate hues. 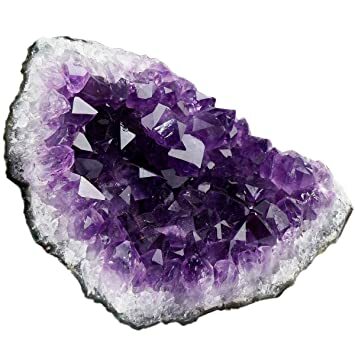 The gem belongs to the mineral species corundum: corundum is colorless, but trace elements or color centers (small defects in the atomic structure of a mineral that can absorb light and impart color to the stone) can turn colorless corundum into colorful sapphire. Red corundum is the only color not called sapphire; corundum with this color is ruby. Blue Kashmir sapphire is legendary among gem collectors and jewelry connoisseurs. However, its reputation for gems of unsurpassed beauty rests on stones mined from 1881 to 1887; very little has been produced since then. Sapphire from the mines after this brief window in time varied greatly in quality. 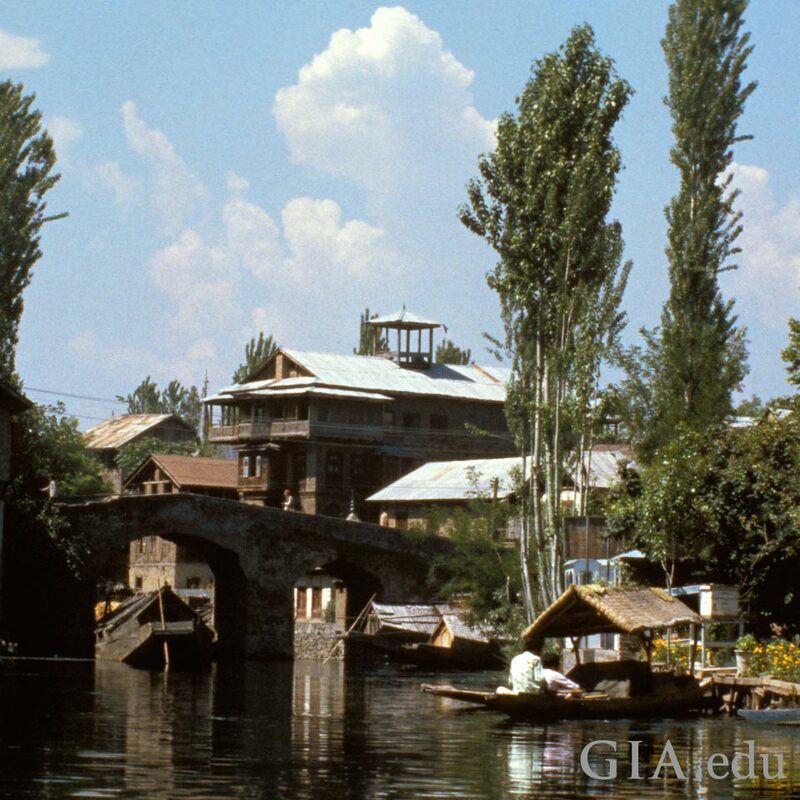 Finding the September birthstone in Kashmir reads like a chapter from an adventure book: we go to northern India, past the picturesque Dal Lake and its famous houseboats, beyond fields of wildflowers and head up into the Himalayas. Our journey takes us on treacherous roads to, as 18th-century explorers described, a “region beyond the snows.” In these remote hillsides, some of the world’s most beautiful sapphires were unearthed. Fine blue Kashmir sapphire is said to resemble the color of the feathers of a peacock’s neck. Tiny inclusions give gems a velvety appearance. This can look like an extremely fine haze. A few last facts about Kashmir sapphire: perpetual snow cover makes mining extraordinarily difficult; the mines are exceedingly remote; the weather is severe; and the area is politically contested. 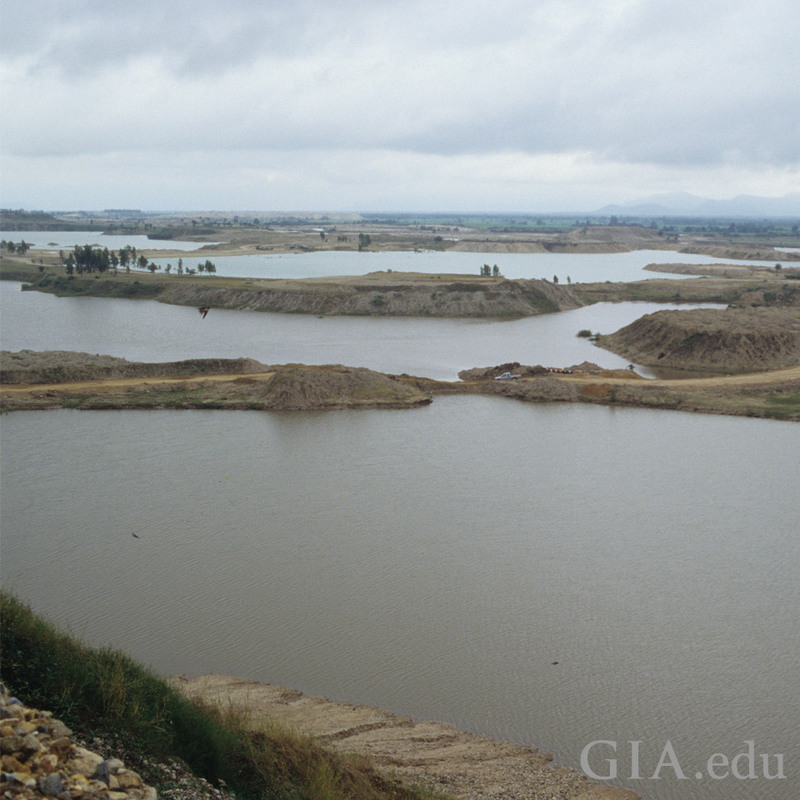 Few stones sporadically emerge, and fewer gemologists have researched the mines. That means you’re highly unlikely to find Kashmir sapphire for sale, and if you do, you’ll want a GIA Colored Stone Identification & Origin Report to verify its country of origin. Fine pieces are occasionally sold by leading auction houses. The land north of Mogok, a city in Upper Myanmar. Blue sapphires mined in Mogok tend to have a rich, intense hue; the best of these September birthstones maintain their appearance under all lighting conditions: incandescent, daylight and fluorescent. The sapphire mines of Mogok share some similarities with the ones from Kashmir: they are remote, hard to reach and are in a politically-charged land. Sapphires from this locale are also rare; they are found near many of the ruby deposits. Mogok is also famed for producing some of the finest pink sapphires in the world. Sri Lanka can poetically be called “Treasure Island”. All colors of sapphire, ruby, cat’s-eye chrysoberyl, spinel, garnet, tourmaline, topaz, quartz and many other gems can be found in the Highland Complex, a wide band that runs roughly down the middle of the island. Some of the finest sapphire is also found here, and in riverbeds scattered across the country. Sri Lanka is perhaps the most famous source for padparadscha sapphires; they are found in river gravel throughout the country. Padparadscha means “lotus flower,” in Sinhalese and this name has been given to the pinkish orange to orange-pink variety of corundum. 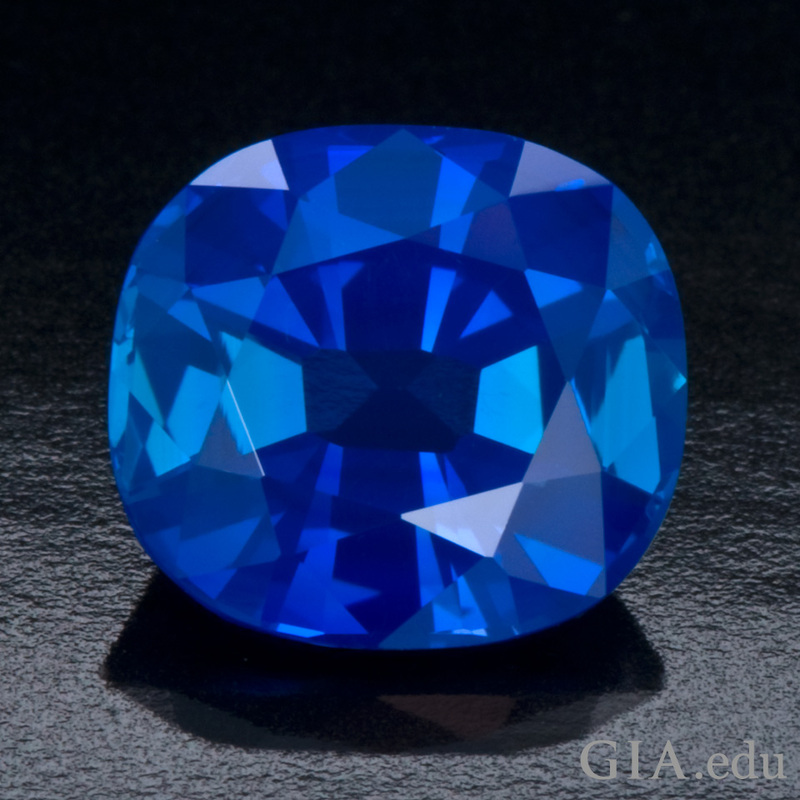 This sapphire’s color has been likened to the color of salmon, sunset and ripe guava. 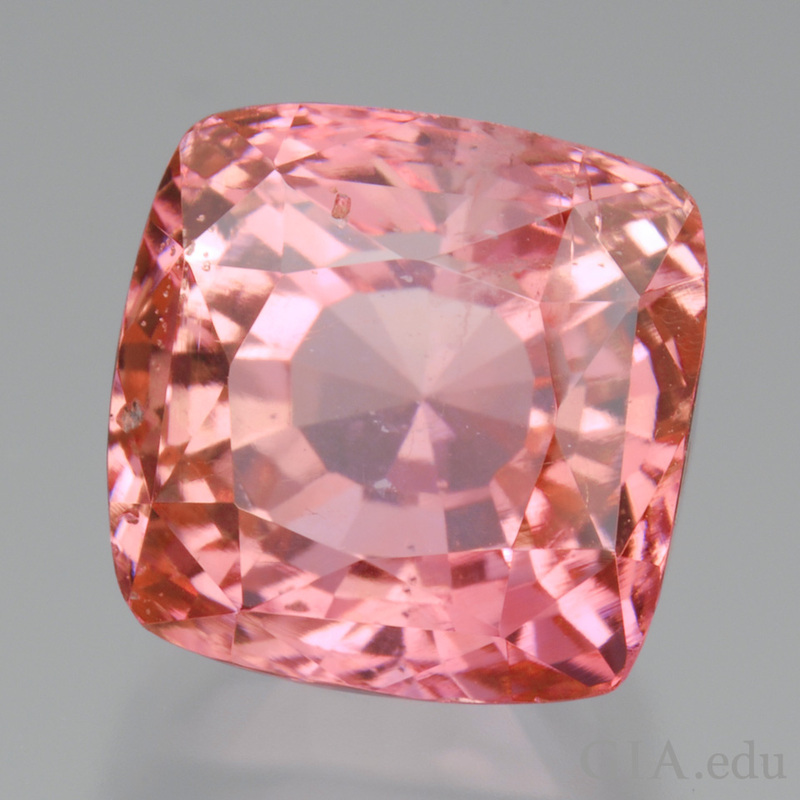 The cause of color for padparadscha sapphire is due to either trace amounts of iron and chromium or color centers. Fine specimens can sell for as much as a ruby. Sri Lanka is also a source of the September birthstone in many of its colors: green, yellow, pink, purple, and virtually any color in between. 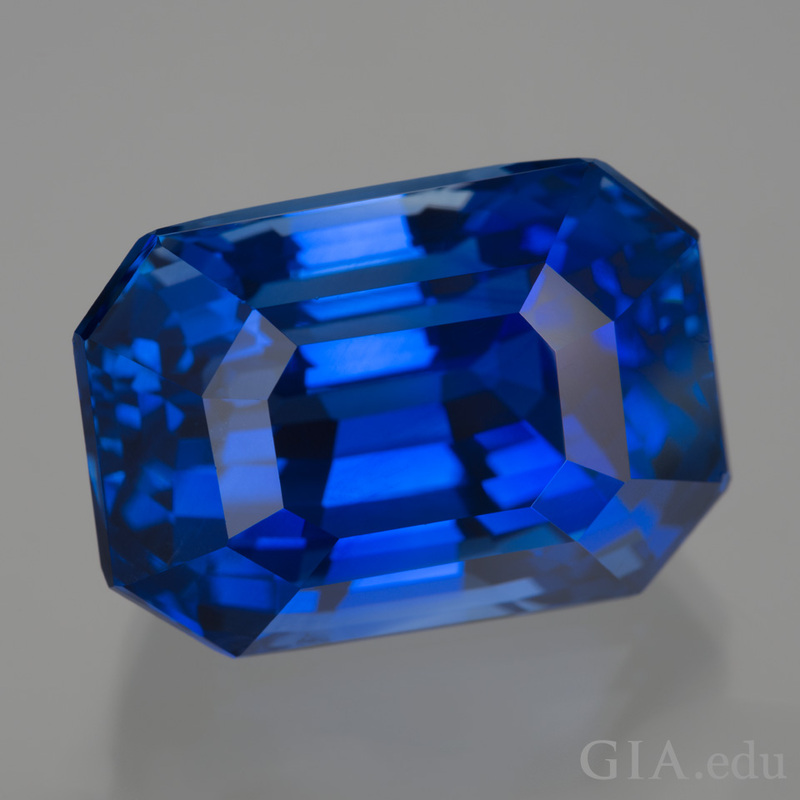 Many in the trade consider Sri Lanka to produce the best range of fancy color sapphires in the world. Thailand is an important source of sapphire. 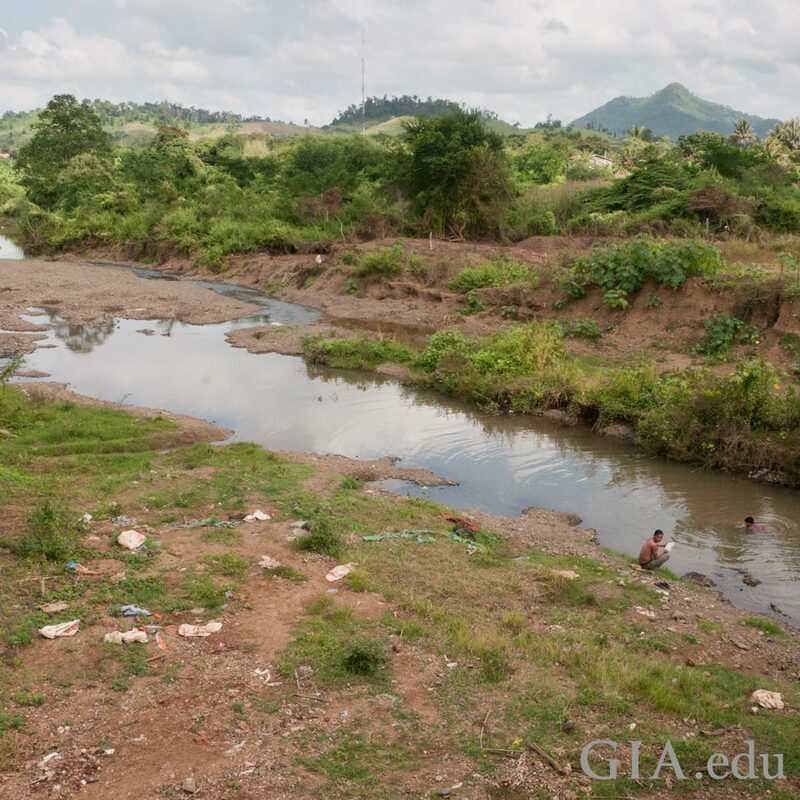 Gem fields in Chantaburi, in southeastern Thailand, were mined from the late 1800s to the early 1900s. 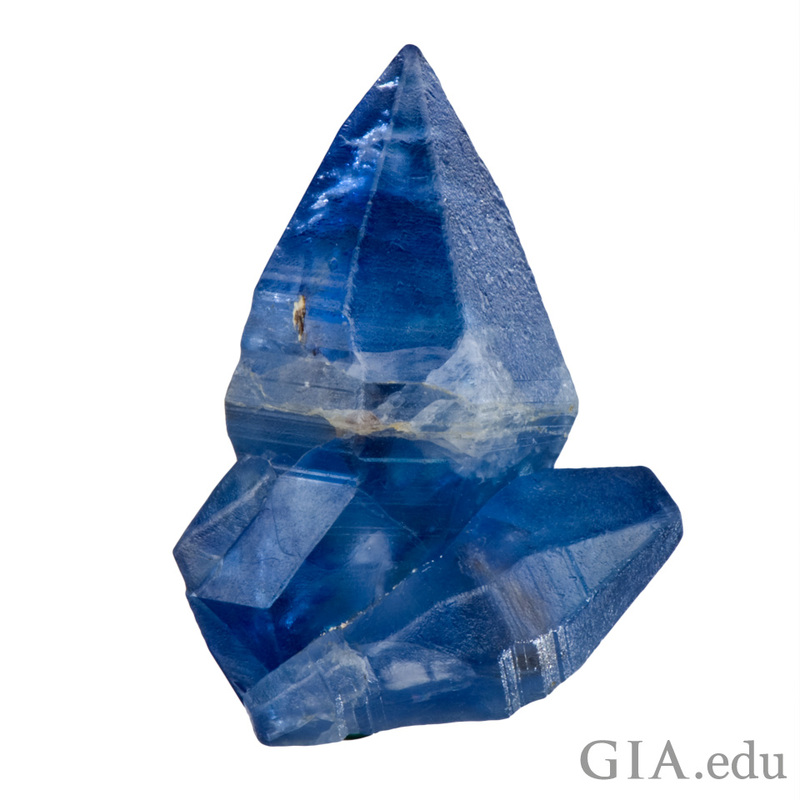 Sapphire now mostly comes from Kanchanaburi (western Thailand), where it is found in rivers and streams. Most sapphire mined in Thailand is heat-treated to improve its color. Thailand is one of the world’s major cutting and treatment centers: sapphire from Myanmar, Cambodia, Australia, Madagascar and Sri Lanka are sent here, and end up in jewelry stores in the United States, Japan and Europe. On the western side of Cambodia—in the Pailin Province, near the border with Thailand—sapphire rough lies in riverbeds. 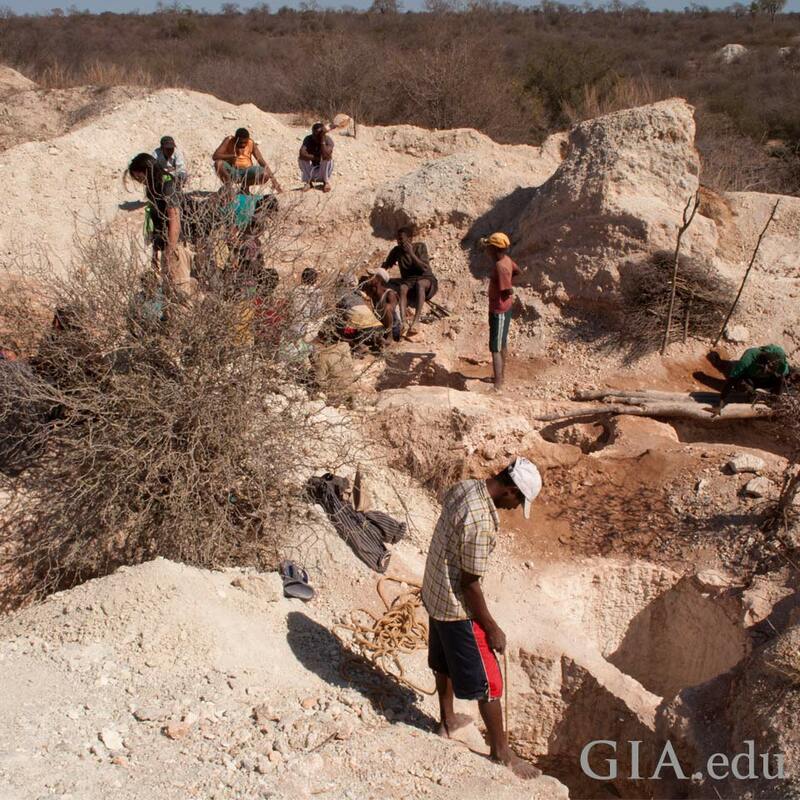 Miners sift through the gravel, looking for “Pailin sapphire,” which is understood to be fine-quality blue sapphire that is typically water-worn, rounded and hexagonal in shape. Stones are regularly heat-treated to lighten color and remove or reduce inclusions. 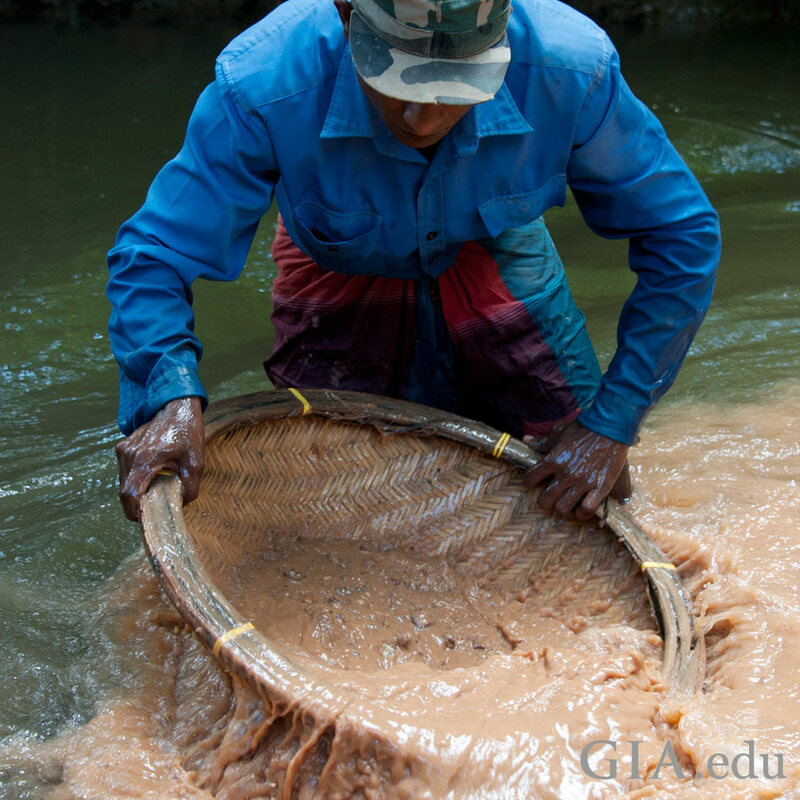 Mining for sapphire in Pailin is extremely demanding. Deadly malaria and a hot climate are working conditions that require muscle and grit. The Khmer Rouge, an oppressive regime that ruled Cambodia from the 1970s to the 1990s, left a legacy of poverty and landmines that still take lives and limbs. Still, in the midst of these most difficult circumstances, miners search for a piece of rough that can change their fortunes. Madagascar, an island off the southeastern coast of Africa, is a rich source of gems: garnet, aquamarine, tsavorite, rubies and of course, the September birthstone. Rough sapphire was found in 1993 in the Andranondambo region of southern Madagascar; and in 1998 in IIakaka – a remote, arid land of plains broken by lonely mountains. A new source was found in January 2016 near Andranondambo in an extremely remote and dangerous location. The mine is accessible only by foot, and the area is rife with bandits. 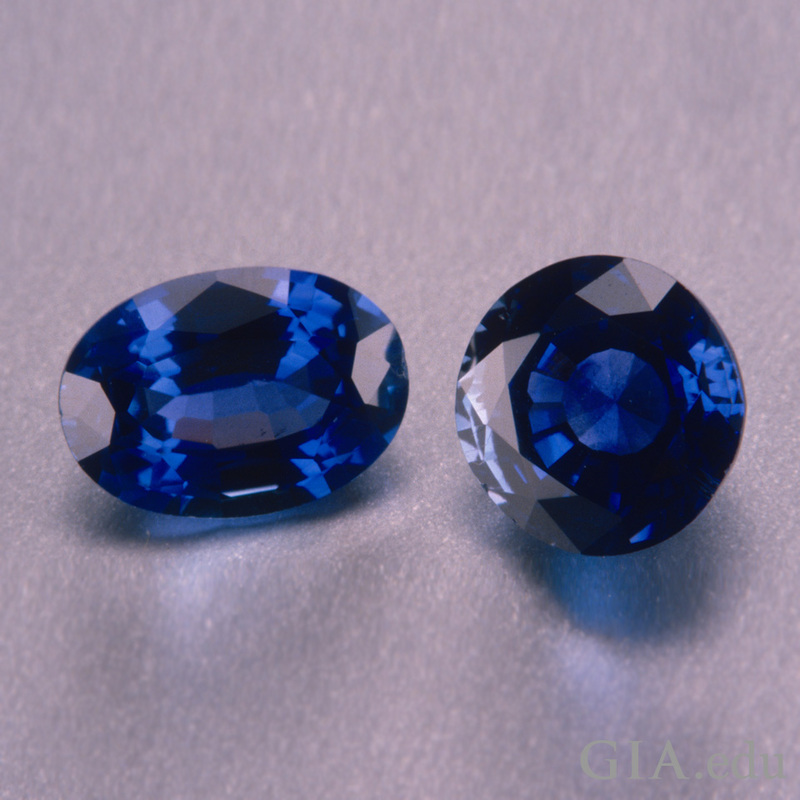 Many people rank the color of Madagascar’s blue sapphires between Kashmir and Sri Lanka in quality. Rough is often heat-treated to improve color. Slight inclusions are common, as well as color zoning (bands of color). 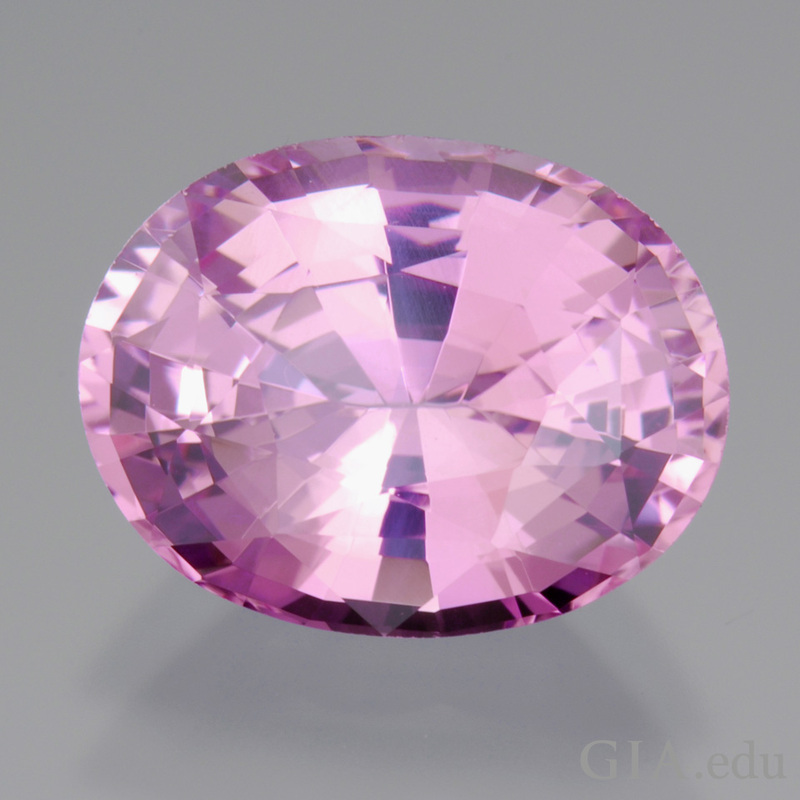 Madagascar is another source for fancy color sapphire: it produces pinks, blue-violets, yellows, oranges and greens. The September birthstone can also be found in other areas of the world. Australia produces blue, yellow and green sapphires. It is primarily a source of commercial-grade sapphire, and occasionally produces high-quality rough suitable for use in fine jewelry. 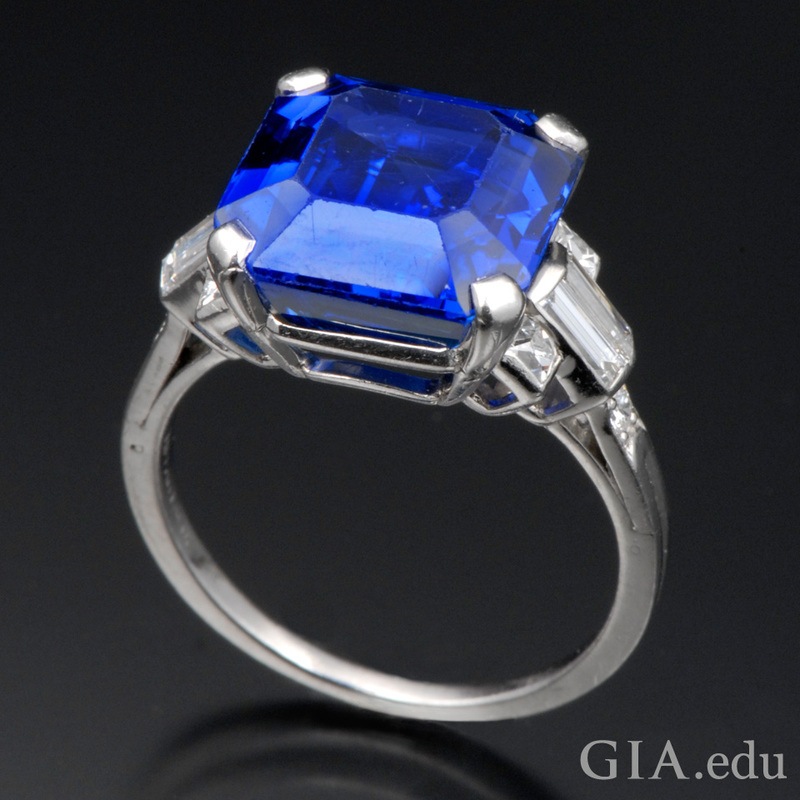 Commercial-grade sapphire is also found in Montana. Tanzania, Malawi and Kenya – countries in East Africa – are other sources of pink, blue-violet, yellow, orange and green sapphires. While the 64.57-carat cut peridot is magnificent, it is overshadowed by the amazing 7.9-cm tall crystal. Both are from Sappat, Kohistan, Pakistan- Jeffrey Scovil. This incredible suite of peridot jewelry has a total weight of 350.40 carats. All are top-quality peridots from Pakistan. – © GIA & Harold & Erica Van Pelt. Since ruby has been used as a gemstone for centuries, it can be seen in a variety of styles, from Indian jewellery to Art Deco and contemporary fine jewellery. Ruby is a durable material that can be worn daily as rings, earrings, necklaces and so on. In Indian style jewellery, rubies are often mixed with emeralds and diamonds. Gold settings provide a striking contrast to the red of ruby. Modern jewellery settings for ruby include white gold and platinum, whereas traditional settings tend to be gold. 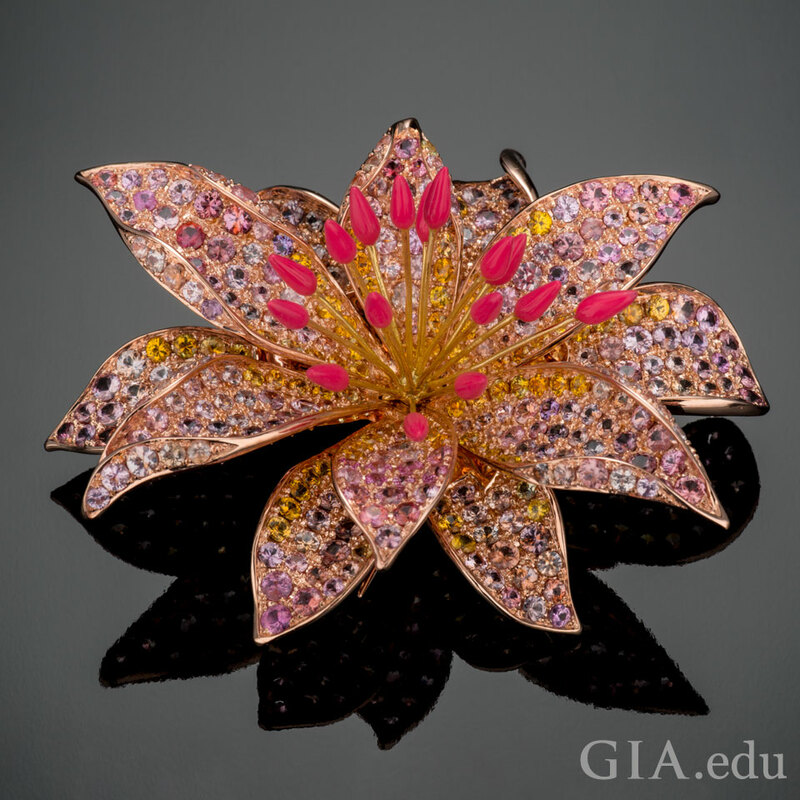 Small rubies can be set closely together in an intricate style such as bead setting or “pavé”, which was made famous by jewellery designers such as Joel A. Rosenthal, known simply as JAR, who created exquisite flower jewels from colored gemstones. Rubies are tough and durable, so they do not require any special care. To clean your rubies, simply use warm soapy water and a soft cloth. Fracture-filled and diffusion-treated gemstones should only be cleaned with a damp cloth. As with most gemstones, ultrasonic cleaners and steamers are not recommended. Always remove any jewellery or gemstones before exercising, cleaning or engaging in harsh physical activities such as sport. Do not expose rubies to acid and store rubies away from other gemstones to avoid scratches. It is best to wrap gemstones in soft cloth or place them inside a fabric-lined jewellery box. A diamond is a stone that truly states, “I love you” in a deep way. 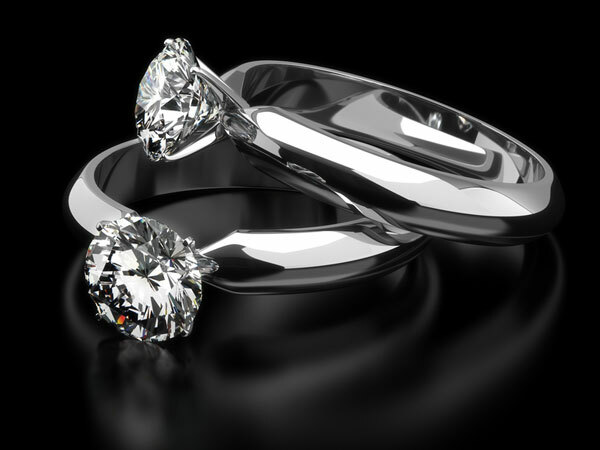 In fact, you’ve probably heard the slogan many times that “a diamond is forever.” This is because of the stone’s symbol of deep, everlasting love, as well as the fact that it’s the hardest substance known on earth.The diamond is also the stone that marks the 60th anniversary of marriage, and is the birthstone for the month of April. It is believed that the first diamonds were discovered in India. In Ancient India, people viewed diamonds as religious icons. Going back to early history, diamonds were always used to engrave tools because of their hardness. Diamonds have been found all over the world on all continents. In 600 AD, diamonds were found in Borneo, an island located north of Australia. In the 1700’s, Brazil was a rich source of diamonds, and in the 1800’s, South Africa was known for their large supply of diamonds. Since the 1970’s, Australia has been a large source for the precious stones. Ancient Greeks named the diamond “adamas,” meaning “invincible,” “indestructible,” “proper,” and “untamed.” Warriors in ancient Greece wore diamonds as the stones were thought to strengthen the warriors’ muscles and bring them invincibility. The power, hardness and beauty of the diamond have been prized throughout history in many civilizations. The famous Persian poet Hafiz remarked that, “the rainbow is confined in a diamond forever”. In antiquity, a diamond was always thought to be a symbol of innocence and purity. Ancient Greeks thought that diamonds represented the tears of weeping gods. Ancient Romans thought diamonds were considered to be parts of the outer rings of stars, which had fallen to the earth. Almost every civilization has some kind of lore on the diamond. Every civilization’s lore however, shares one theme- that the diamond symbolizes all forces necessary for a healthy society, and that it brings its wearer great strength. The diamond was always considered a stone of winners. In fact, it was the talisman of Julius Caesar, Louis IV and Napoleon. The Renaissance Period was the first point in time when diamonds were used as engagement rings. They were thought to be a special gift, which represented the very ultimate gift of love. In 1477, this trend was started when Archduke Maximillian gave Mary of Burgundy a diamond engagement ring. This was a trend that was only popular among royalty and the very wealthy. Giving a diamond as an engagement ring did not actually become a standard until the De Beers marketing campaign started, during the 20th Century. Today, the primary use of diamonds is no longer for carving or protection during battles. They are now used for adornment because of the their sheer beauty- their dispersion of white light into many different beautiful colors, and their brilliance and indestructibility. Gemologists now rate diamonds based upon what is called “the 4 C’s,” referring to carat, cut, color, and clarity. “Carat” refers to the weight of the diamond. “Cut” refers to the brilliance of the stone, as the way it is cut determines how much brilliance a diamond will have. “Clarity” refers to the natural blemishes found inside diamonds (and remember, a flawless diamond is extremely rare). Finally, “color” is the last important factor when choosing a diamond. The highest color ranking for a diamond represents a completely clear and colorless stone. As the hardest mineral in existence, a diamond is highly regarded for its beauty and ability to reflect light in an extremely dazzling way. Diamonds display a large amount of brilliance and fire, meaning they sparkle a lot, and always retain a freshly polished look.Created out of pure carbon, the carbon atoms within diamonds are bonded very strongly, which makes for the hardness and strength of the stone. Diamonds are the hardest known substances. Because of the strength of this carbon bonding, diamonds rate a 10 on the Mohs scale- meaning they are as hard as a stone could possibly be. Since antiquity, it has been known that diamonds are the hardest stone. Because of this, the hardest diamonds can only be scratched with other diamonds. Also because of their hardness, not too much care is needed to keep your diamond looking new. It keeps a polish for a very long time and is therefore suitable for everyday wear. Other chemicals cannot affect diamonds, because they are the most durable and inert material. In their most natural form, diamonds are clear, but because of impurities of light elements, such as nitrogen, diamonds can also be found in colors such as orange, green, blue, pink, black, yellow, orange, green, red, and brown. The brilliance of a diamonds comes from a combination of reflection, dispersion, and refraction. A ray of light first passes through a diamond and is then bent, or refracted. Then, this bent ray is reflected through a facet at the bottom of the stone and through the top of the stone. When refraction occurs, each ray is bent at a slightly different angle, which is referred to as dispersion. Of all gems, diamonds have the highest index of refraction. The most popular cut of diamond is called a brilliant cut, a cut where numerous facets are placed so the most rays of light will reflect through them. This cut is determined by mathematical and empirical analysis. A Brilliant cut does not refer to the shape of the actual stone, but the proportion and symmetry of the diamond. A beautiful, 10.06 ct pear shaped aquamarine is surrounded by 72 round diamonds (0.35 carats) set in platinum. The Abdurreza turquoise mine lies in a dry, remote area of Iran. The traditional source for the top color, sometimes described as robin’s-egg blue or sky blue, is the Nishapur district of Iran, the country formerly known as Persia. So, quite often, you’ll hear people in the trade call turquoise of this beautiful color “Persian blue,” whether or not it was actually mined in Iran. 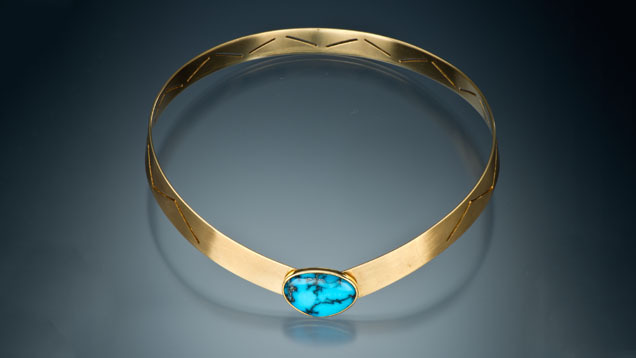 Top-quality turquoise has inspired designers to create elegant jewelry. It’s most often cut into cabochons, but it might also be cut into beads or flat pieces for inlays. 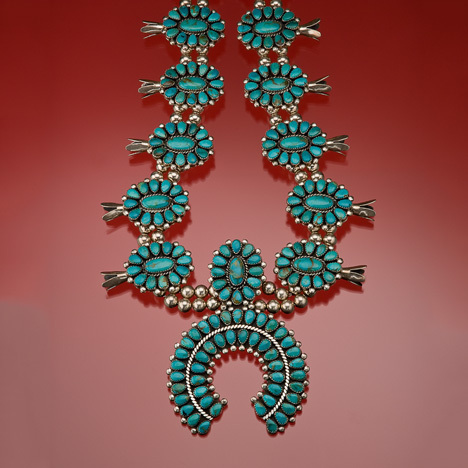 Although much turquoise jewelry is sleek and modern, many US consumers are familiar with the traditional jewelry of Native American peoples such as the Pueblo, Hopi, Zuni, and Navajo. People interested in Native American arts and crafts frequently collect this stylized silver jewelry. Turquoise is relatively soft, so it’s ideal for carving. 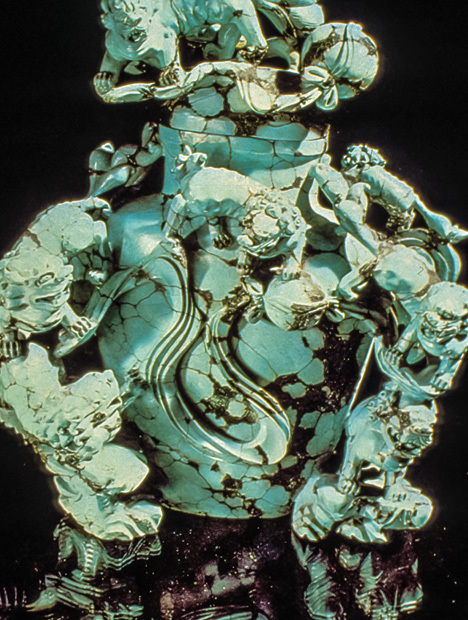 Artists in Europe, Asia, the Middle East, and the Americas choose turquoise as a medium for carved jewelry and art objects. It’s often fashioned into talismans with Native American significance, such as bird and animal carvings, called fetishes. 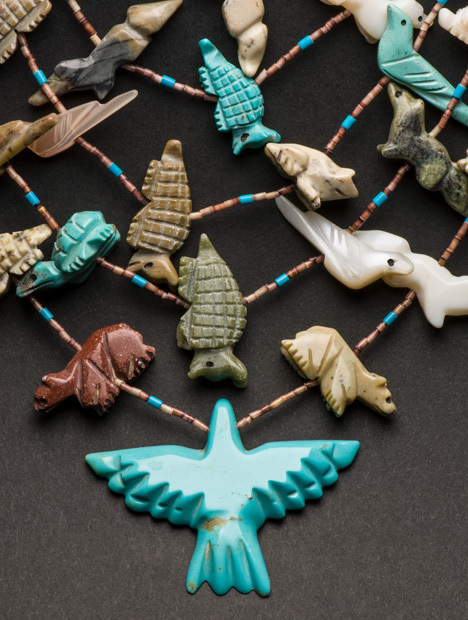 Native American jewelry often features carved turquoise birds and animals, called fetishes. Courtesy Jaime Steelman. Turquoise owes its texture to its structure and composition. It’s an aggregate of microscopic crystals that form a solid mass. If the crystals are packed closely together, the material is less porous, so it has a finer texture. 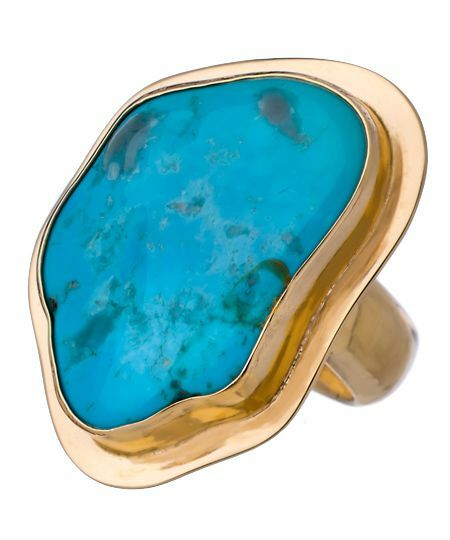 Fine-textured turquoise has an attractive, waxy luster when it’s polished. Turquoise with a less-dense crystal structure has higher porosity and coarser texture, resulting in a dull luster when it’s polished. Porosity and texture don’t just affect appearance: They also affect durability. Turquoise is fairly soft—it ranks 5 to 6 on the Mohs scale. Turquoise with a coarse texture might have poor toughness, too. Samples with finer texture have fair to good toughness. In turquoise, low porosity and fine texture are more valuable than high porosity and coarse texture. Coarse, porous stones are usually treated to make them smoother, shinier, and more marketable. Turquoise deposits usually form in iron-rich limonite or sandstone. Limonite creates dark brown markings in turquoise, while sandstone creates tan markings. These markings are remnants of the host rock within the turquoise, and can resemble splotches or veins. They’re called matrix. Turquoise is generally embedded in its host rock, like this specimen from Iran. Manufacturers try to fashion turquoise so that no matrix is visible, but sometimes it’s unavoidable. Small amounts of turquoise might be scattered through the host rock in such a way that the rough material can’t yield any cut specimens large enough to fashion into gems without including some matrix. The matrix in spiderweb turquoise is attractively arranged in a network of thin lines. The presence of matrix can lower the value of turquoise, but that doesn’t mean turquoise with matrix is worthless or unmarketable. Some buyers actually prefer the presence of matrix in fashioned turquoise if its effect is attractive and balanced. This is especially true if it’s a type of turquoise known in the trade as spiderweb turquoise. It contains matrix in thin, delicate, web-like patterns across the face of the gemstone. The patterns provide a dark contrast to the gem’s bright blue. In the market for top-quality turquoise, stones with no matrix at all command the highest prices. Gems with attractive spiderweb matrix rank second in value. Peridot is a well-known and ancient gemstone, with jewelry pieces dating all the way back to the Pharaohs in Egypt. The gem variety of the mineral Olivine, it makes a lovely light green to olive-green gemstone. The intensity of color depends on the amount of iron present in a Peridot’s chemical structure; the more iron it contains the deeper green it will be. 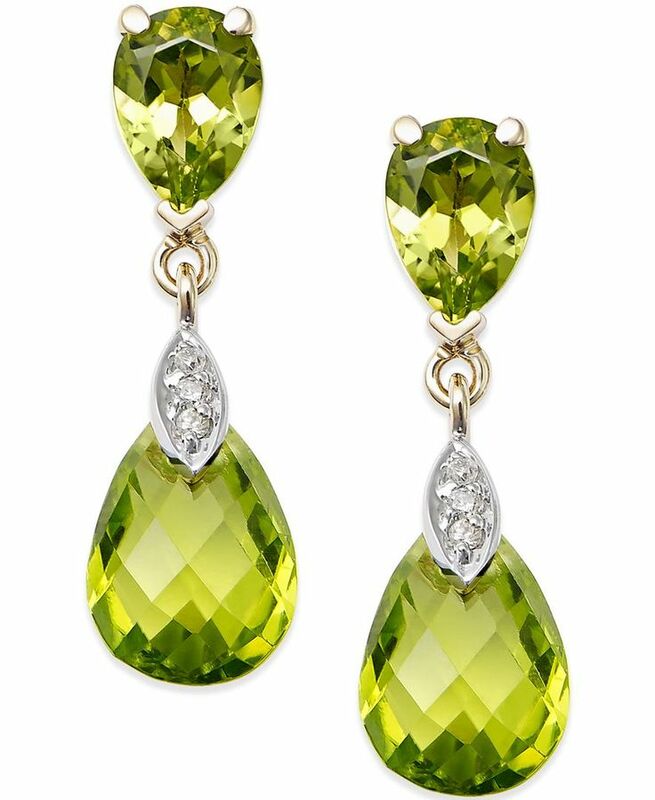 The most desirable color of Peridot is deep olive-green with a slight yellowish tint. Deeper olive-green tones tend to be more valuable than lighter colored greens and yellowish-greens. Ruby is the birthstone for July, and the 15th and 40th year anniversary gemstone. Undoubtedly one of the rarest gemstones. This aluminum oxide gemstone can certainly protect itself, as it is the second hardest gemstone behind the diamond. The ruby’s extreme durability allow it to be cut into every size and shape, creating unique examples of fine jewelry. 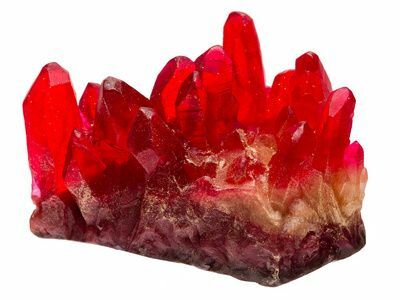 Corundum is the host mineral in which ruby deposits are found; the trace elements introduced into the corundum determine whether or not a ruby is formed. 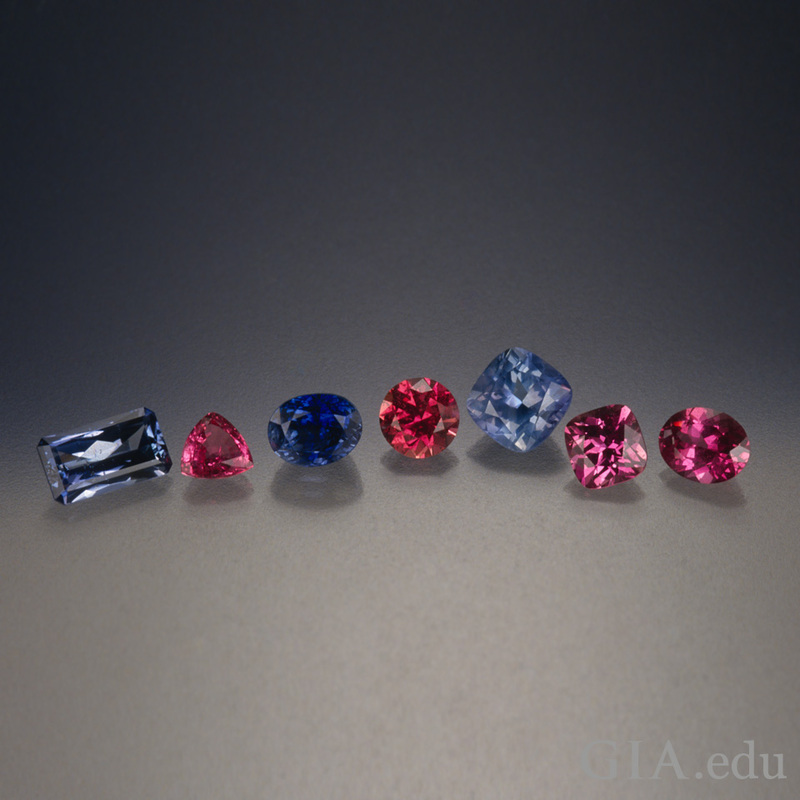 When the coloring agent chromium is introduced, a ruby is produced, while other trace elements will produce the gemstones known as sapphires (iron, for example, is the element responsible for blue sapphire). 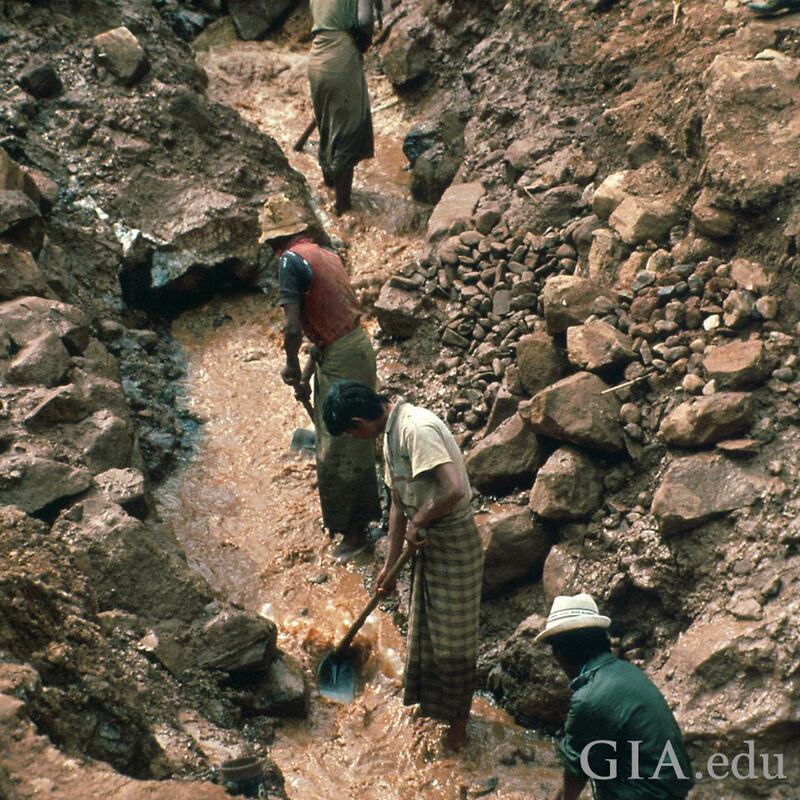 Historically the leading ruby-mining countries have been Myanmar (Burma) and Sri Lanka. Today, rubies are found in Thailand, Madagascar, Africa, and Vietnam. Due to the U.S. moratorium on gemstones and pearls from Myanmar, fine rubies are particularly difficult to obtain. Natural rubies are a very slow-growing crystal, making it rare to see a large ruby of almost any quality. Made of gold with enamel, sapphires, rubies, emeralds, diamonds, and pearls, the Crown of Princess Blanche, also called the Palatine Crown or Bohemian Crown, is the oldest surviving royal crown known to have been in England, and probably dates to the years after 1370. The crown came to the Palatinate line of the House of Wittelsbach in 1402 as a dowry of Princess Blanche of England, a daughter of King Henry IV of England, on her marriage to Louis III, Elector Palatine. However, it is not thought that the crown was made for Blanche because it was first recorded in a list of 1399, recording the movement of some royal jewels in London, some two years before the marriage of Princess Blanche. Experts believe that the crown probably belonged to King Edward III or Queen Anne of Bohemia, the wife of King Richard II, whom she married in 1382. The crown is in a fleur-de-lis (lily flower) shape, popular for medieval crowns, with twelve lilies rising from the circlet. The circlet’s design is based on twelve gold rings beneath the lilies, mounted with hexagonal shapes in enamel and gold openwork. The lily stems are detachable, and the places on the crown where they fit are numbered I to XII so they can be re-attached correctly. Its height and diameter are both 18 cm. It has been described as “one of the finest achievements of the Gothic goldsmiths”. Since 1782, the crown is displayed in the treasury of the Munich Treasury with other jewels belonging to the Palatine branch of the Wittelsbach family. Discovered in California in 1902, this pale pink stone was named after the man who introduced it to the world, Tiffany & Co.’s chief gemologist George F. Kuntz. Just over a hundred years, this gem is considered to be young in gemology. onto the next season of my life..
Never forgotten, strongly sealed with a kiss! 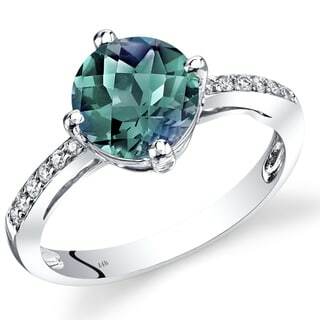 Besides Pearl being June’s traditional birthstone, “Alexandrite” is a lovely alternative. 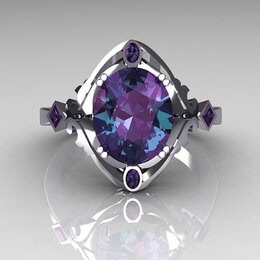 Those born in June are lucky to claim their birthstone as the beautiful precious gem alexandrite. This exciting gem may appear to be magic when it appears in shades of green and blue or yellow and structure; absorbing light wavelengths within the yellow spectrum, making the gem appear to change color in different light sources. Alexandrite rose to prominence in 1830 in the Ural Mountains of Russia. Tied to the czar, Alexander II, the gem gets his name from him. The colors of the stone, which change from green to red due to light source, were the Russian flag’s colors at the time. The Ural Mountains were quickly depleted of the gem due to over mining. Russian royals were gifted with alexandrite jewelry in the forms of necklaces and rings. Alexandrite can be found in Brazil, Sri Lanka, and East Africa. These changes in color occur in chrysoberyl (alexandrite’s family), wherein aluminum is replaced by chromium ions in alexandrite’s structure; absorbings light wavelengths within the yellow spectrum, making the gem appear to change color in different light sources. Notable June birthdays include actors Johnny Depp and Chris Evans, musicians Lana Del Rey and Ariana Grande, sports legends Lou Gehrig and Joe Montana, and Hollywood stars including Marilyn Monroe and Tony Curtis, and cutest wargamer Colin Brady 🙂 . 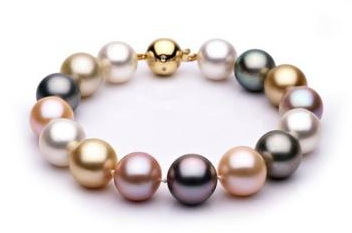 Natural Pearls are very delicate gems and can be easily damaged by the surrounding conditions. It is extremely important to care for pearl jewelry. With proper care the gems will last for centuries. 1) When pearls are worn very often and close to the skin they get eroded or damaged with contact with even the mildest of acids given out by the skin. Hence the use of pearl jewelry very often in humid places is not advisable. 2) Pearl jewelry like pearl earrings, pearl rings etc should not be kept in cotton wool as it contains small amounts of acids that may damage the pearl in the long run. 3) String of pearls or pearl jewelry should not be kept in polythene bags as there isn’t enough moisture for the pearls in these bags, which will create a water loss and damage the outer surface of the pearls. 4) The best way of storing pearls would be to keep them well wrapped in white linen cloth or pure silk. 5) Cosmetics and perfumes must never come in contact with pearls as the acids and chemicals most certainly will damage them. 6) Restringing of pearls that are very often used is a very good idea as many a times the string may absorb the perfume of cosmetics used and in turn damage the pearl. The string used (if silk) by itself may wear out or may break. 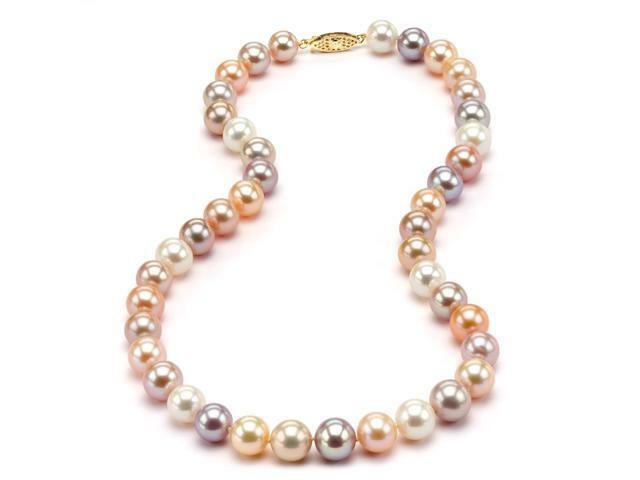 It is advisable to restring regularly used pearls once every six months. 7) The best way of stringing pears is to have a knot at the end of each pearl so that in case of breakage of the string only one pearl is lost. Mother’s rings available…please contact me for custom order. 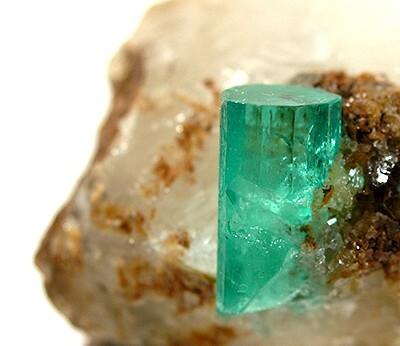 The gemstone Emerald is the green variety of the mineral beryl. Emerald is the May birthstone. The wonderful green color of emerald is unparalleled in the gem kingdom. Emerald’s precious green color is caused by small amounts of chromium and enhanced by traces of iron. Unlike other beryls, emeralds usually contain inclusions and other flaws. These flaws are not looked on as negative aspects for emerald like they would be for other gemstones. Indeed, these flaws are considered part of the character of the stone and are used to assure the purchaser of a natural stone. Even artificial emeralds often contain flaws, however, as the process of growing artificial emeralds mimics the way nature does it (slow crystal growth from a molten mix). Nearly all emeralds, even many “natural” stones, have been treated to improve clarity, generally by immersing them in oil. For gemstones, a green colored oil is sometimes used, “improving” the color as well. Unfortunately, this oil may evaporate over the years, making flaws appear where none were visible at the time of purchase. A high-grade mineral oil may be used to improve the appearance again. In (basic) cleaning my diamond ring, I like to use Dawn dish soap (works great at cutting out grease/oil ) in a small bowl with some warm water, using a baby toothbrush, getting into all the crevices of the ring underneath (where grime usually builds up and “hides”) then I rinse ring with water in a separate bowl. After rinsing, I lightly pat dry with soft cloth. After ring is dry, I use jewelers’ polishing cloth on metal part of ring. I highly recommend using “Sunshine” polishing cloth (works great!) . 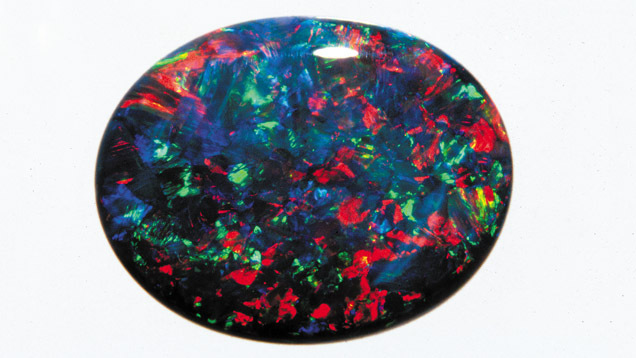 The ‘Virgin Rainbow’ is one of the world’s rarest and most expensive opals. This extremely rare opal exhibits incredible fluorescence with a rainbow of different colors that make opal so distinctly unique. The opal was found in Coober Pedy of southern Australia by miner John Dunstan, working solo in the opal field. It is worth over $1 million and is now owned by the Southern Australia Museum in Adelaide. 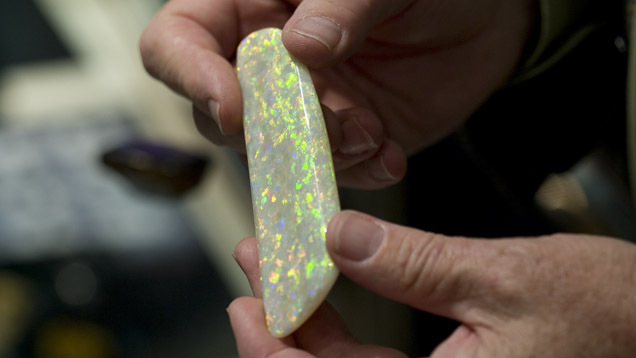 “That opal actually glows in the dark – the darker the light, the more colour comes out of it, it’s unbelievable.” John Dunstan told ABC. The Virgin Rainbow is an opalized fossil, which means the shape and initial formation of the opal replaced a fossil, likely from an ancient ancestor of today’s cuttlefish. The very generalized evolution of the opal started with an aquatic cuttlefish dying and sinking to the seafloor. As sediment buried the fish, the surrounding sediment began to lithify into rock as the shallow sea dried and became a desert. Meanwhile, silica rich pore fluids within the rock deposited opal in the cavity where the cuttlefish once remained. This is a similar process to how petrified wood is formed, whereby mineral precipitates replace organic objects. 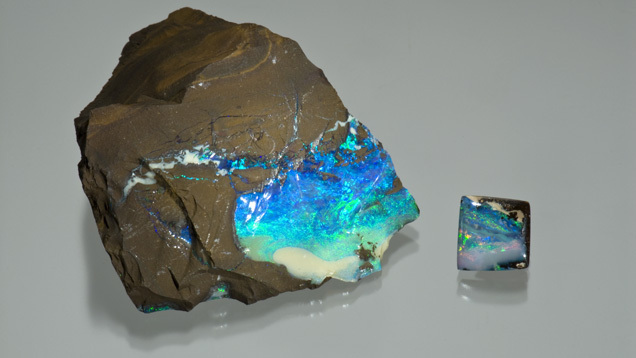 Opals form as microscopic spheres composed of silica and other minerals, closely packed together to form a lattice framework. The order and variability in size of silica spheres determines the degree and type of diffraction of light as it passes through the opal’s structure. More regular-sized silica spheres provide more intense diffraction and are thus more desirable. Australia has the world’s largest supply of opals, accounting for 95-97%, with most of them found in southern Australia. 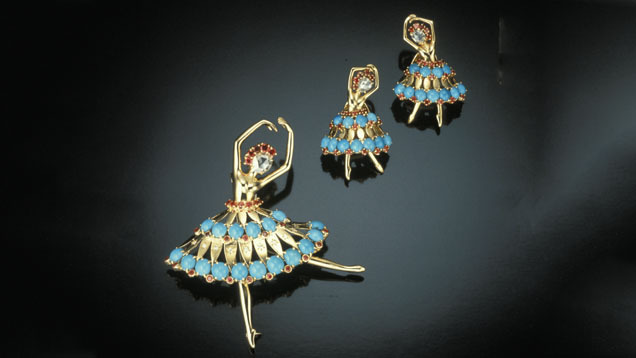 Of the prolific South Australia mines, Coober Pedy is the most famous, claiming many of the world’s famous opals. written by Trevor Nace , geologist, Forbes contributor, and adventurer. Blue is a color beloved by many. 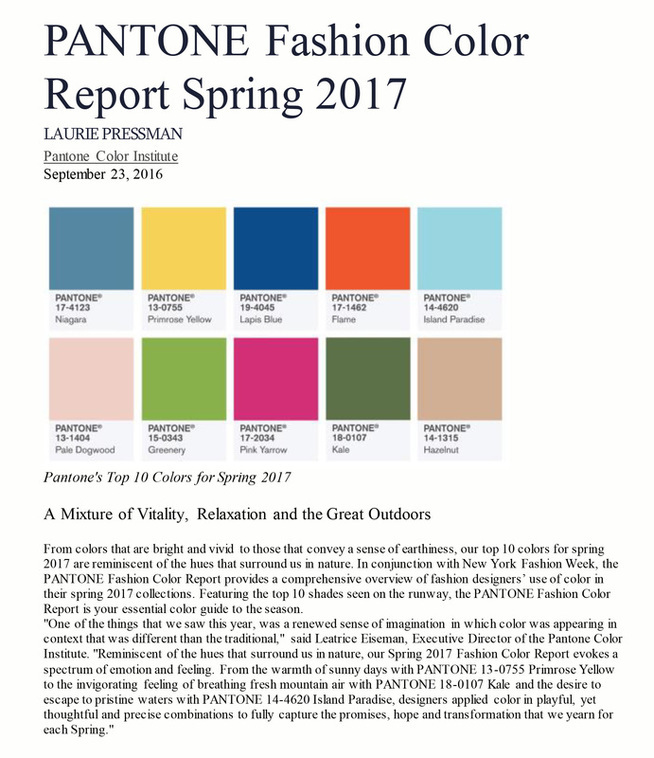 My passion for the color blue spans a wide range of blue tones, from light pastel Sweden Princess blues to the rich and velvety Royal Blue sapphires. 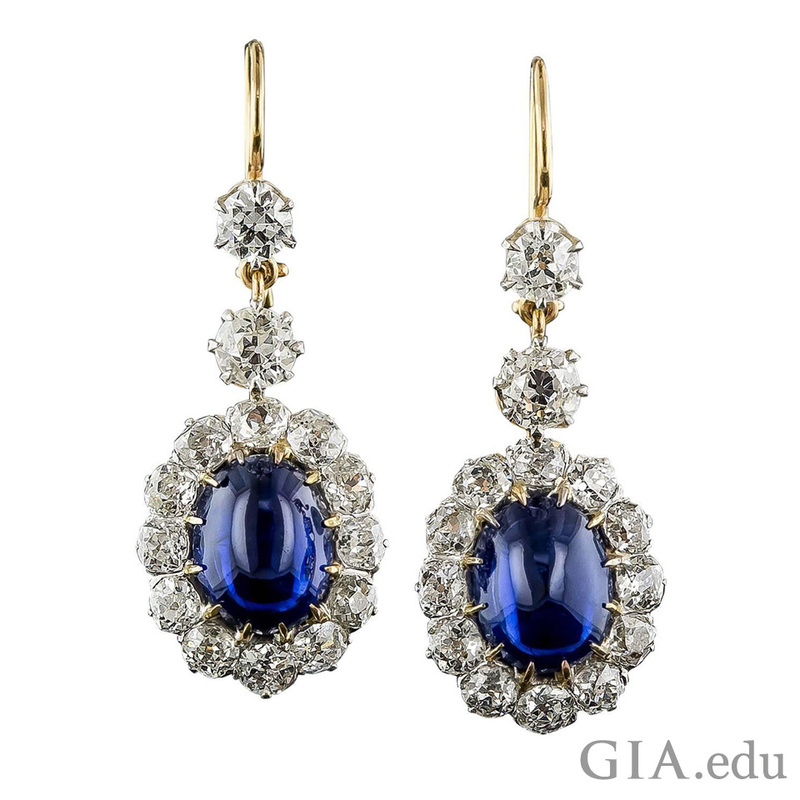 A sapphire with a color designation of Royal Blue and a cut grade of Excellent would indicate the gem to be a wonderful medium to medium dark blue with extraordinary brilliance that’s evenly distributed throughout the sapphire. If you see a sapphire that you like, but would prefer a different shade of blue in the sapphire I would be happy to work with you to achieve a ring you’ll love. Peridot belongs to the forsterite-fayalite mineral series, which is part of the olivine group. 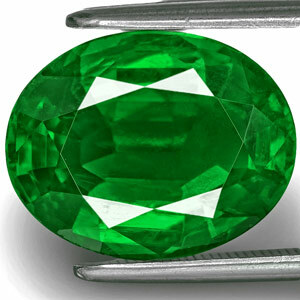 It is one of the “idiochromatic” gems, meaning its color comes from the basic chemical composition of the mineral itself, not from minor impurities, and therefore will only be found in shades of green. 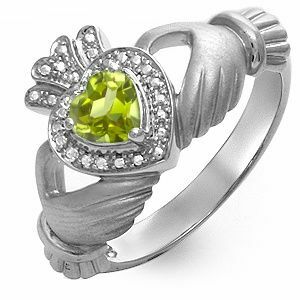 As a matter of fact peridot is one of the few gemstones found in only one color. The name peridot most probably derives from the Arabic word “faridat” for gem. It’s also called chrysolith (derived from the Greek word “goldstone”) and olivine, because of its color and membership to the olivine group. Historically the volcanic island Zabargad (St. John) in the Red Sea, east of Egypt, was the most important deposit that was exploited for 3500 years. Today’s main deposits are in Arizona, China, Vietnam and Pakistan. The Pakistani peridot in particular is very fine, and a new find in Pakistan in the mid-1990’s has made peridot available to a wider market. Peridot is not especially hard – 6.5-7 on the Mohs scale — and tends to burst under great stress and therefore is sometimes metal-foiled. Peridot has no resistance to acids. An intense, deep green color is the favorite. The best colored peridot has an iron percentage of less than 15% and includes nickel and chromium as trace elements that may also contribute to the best peridot color. Peridot looks best in daylight. Its brilliant green sparkle does not change in artificial light. Peridot is commonly a transparent stone. Inclusions can create a cloudy nature in larger stones. Peridot cat’s eye and star peridot (showing four rays of light) are known, but a rarity. Table and step cuts are popular. Sometimes peridot gets a brilliant cut especially if to be set in gold. Historically the volcanic island Zabargad (St. John) in the Red Sea, east off Egypt, was the most important deposit that was exploited for 3500 years, abandoned for many centuries, rediscovered only around 1900 and has been completely exploited since. The most important deposits nowadays are found in Pakistan (Kashmir region and Pakistan-Afghanistan border region) and is regarded as being of the finest quality. Beautiful material is also found in upper Myanmar and Vietnam. Other deposits have been found in Australia (Queensland), Brazil (Minas Gerais), China, Kenya, Mexico, Norway (north of Bergen), South Africa, Sri Lanka, Tanzania and the United States (Arizona and Hawaii). 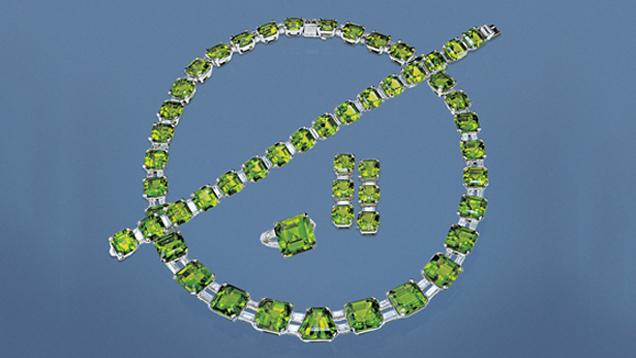 There are no treatments known that could enhance the quality of peridot. Peridot is mentioned in the Bible under the Hebrew name of “pitdah”. Peridot gems along with other gems were probably used in the fabled Breastplates of the Jewish High Priests, artifacts that have never been found. 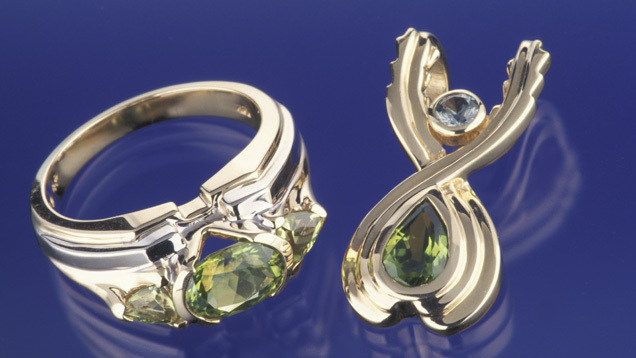 Legend has it that peridot was the favorite gemstone of Cleopatra. Crusaders brought peridot to Central Europe where it is found in many medieval churches such as the Cologne Cathedral. In the Baroque era the deep green gemstone experienced another short flourishing, before it became forgotten again. Napoleon used peridot to assure the empress Josephine of his undying love and admiration, which, of course, happened before he had their marriage annulled. Throughout time, peridot has been confused with many other gemstones, even emerald. Many “emeralds” of royal treasures have turned out to be peridots. The largest cut peridot was found on the island Zabargad, weights 319ct and belongs to the Smithsonian Institution in Washington D.C. 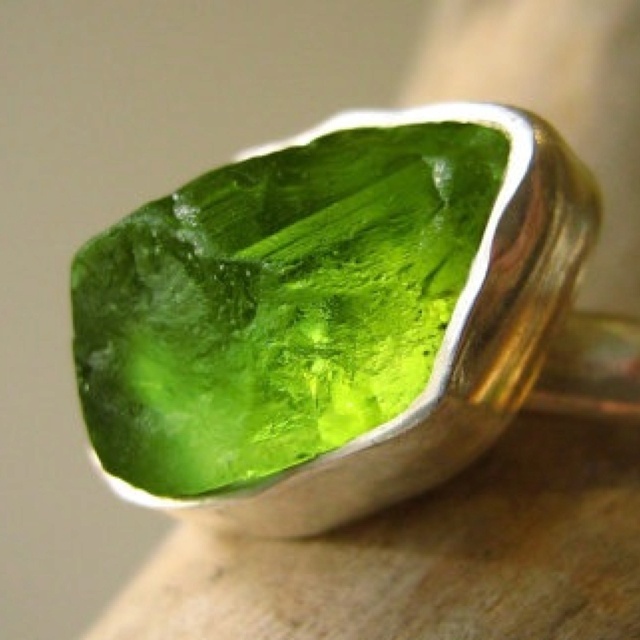 In Russia there are some cut peridots that came out of a meteorite, which came down in eastern Siberia in 1749. June birthstones: Alexandrite, Pearl or Moonstone? Various birthstone lists have been used in different cultures for thousands of years. The traditional birthstone list is based on birthstone traditions from the fifteenth to the twentieth century. Since then, many of the traditional stones on the list were changed to correspond with stones that were more commercially available. In 1912, the American National Association of Jewelers adopted a list which included alexandrite and that was accepted as the standard in the United States and many other countries. In 1952 the American National Retail Jewelers Association, the National Jewelers Association and the American Gem Society approved a variation of the list. In this list, alexandrite is offered as an alternative to pearl and therefore associated with the month of June. It is also suggested as the gemstone for a 55th wedding anniversary (sometimes also the 35th or 45th in place of emerald). Certain months offer various options for the modern birthstone. 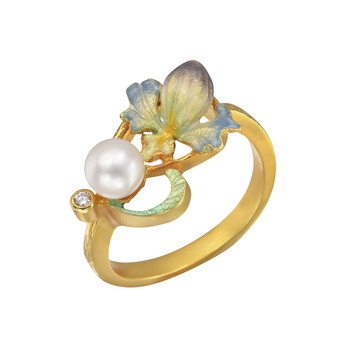 For example, for those who want to purchase the birthstone for June, alexandrite, pearl or moonstone may be chosen. Pearls are a classic choice, while natural alexandrite is expensive and rare. 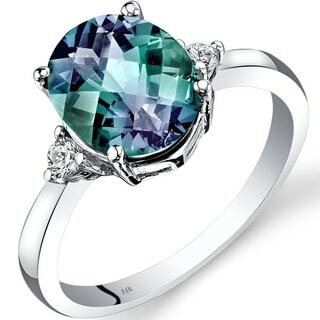 In response to the costs associated with alexandrite, some retailers have selected their own stone to represent the month of June, including green tourmaline to represent the green color of alexandrite, or pink tourmaline to represent the red, or color change garnet because of the change. For more info and pricing, please inquire within. A thorough evaluation of your jewelry will be conducted privately and professionally, with the greatest concern for your safety. Under no circumstances would your valuables need to be removed from your sight. The tools and gemological equipment I use are portable, so you may choose to have your jewelry evaluated in your home or at my office. Appointments are approximately an hour and half. * A thorough evaluation of your jewelry, colored gemstones and pearls. * Gemstones and pearls can be identified using the latest Gemological tools. * Gemstones can be weighed and measured. The total weight of gem set in mounting can be estimated. * The design style and time period of each piece can be identified. * Instruction on the proper care and maintenance of your jewelry will be provided. Whether your taste runs towards trendy or traditional, as your jewelry consultant I can create colorful jewelry that will enhance any fashion design, taking in one’s features. Your favorite color may be blue; but what is the best blue on your skin tone? All colors have undertones that may not be apparent to most people. As your jewelry consultant I can correctly identify which undertones are compatible. As your jewelry consultant, I understand the psychology of color, I know how to achieve the highly desirable and harmonious color flow you seek for your style. Colors look different under different lighting conditions. As your jewelry consultant, I consider this an important factor and I will make sure that the romantic red you pick does not end up looking orange. Using my design skills and knowledge of jewelry manufacturing, I invite you to consider my services as a jewelry designer/communicator of your creative ideas for a special one of a kind piece of jewelry. Custom jewelry is the perfect gift for any occasion. Create a one of a kind treasure: consider a Mother’s ring, a Sweetheart ring or pendant, updating into custom wedding bands, mark a milestone with a custom necklace, or choose custom earrings with interesting colored stones for a thoughtful birthday gift.